Our holiday home is situated in Little Oneroa with beautiful views across the harbor back to the Oneroa village. It is also just 5 minutes drive from the passenger ferry terminal and Oneroa Village. 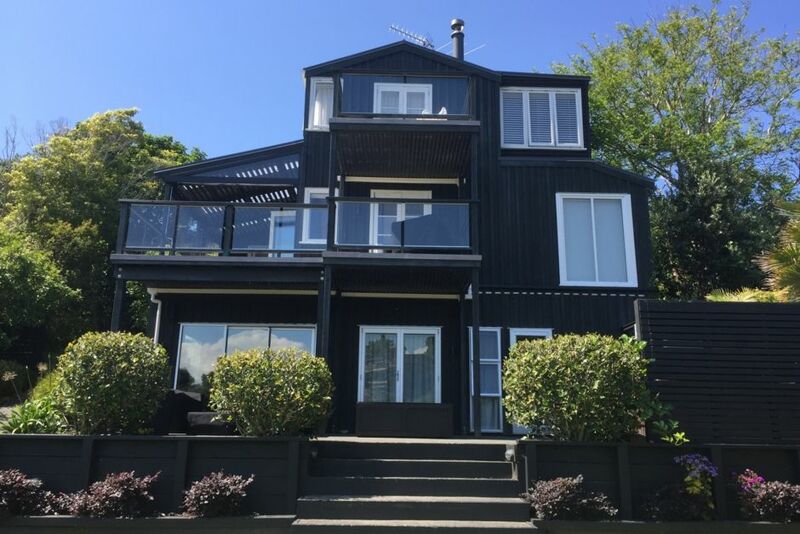 Located down a quiet road on a sloping 1500 m2 section, our three level home provides great sea and bush views, native New Zealand bush walks, several outdoor dining and entertainment areas (including a Garden Cocktail Bar) and a Spa pool to relax in. Just 3 minutes walk away is Fisherman’s Rock as well as a private pebble beach known only to locals. Several great public beaches are only a few minutes away by car. Picnic equipment and a single kayak are also available to use. This is an ideal holiday home suitable for families, couples and groups of friends. We will also greet you and handle any property queries and local knowledge requirements that you may have. The neighborhood, sometimes known as “Little O”, includes a mixture of locals and holiday homes. The nearby “Little O” beach has a children’s playground and is only 15 minutes walk away. Next to this is the “Big O” beach and is popular with all ages. Guest access is 3pm-8pm on the day of arrival, or earlier if agreed. - Drivers must be 25 years of age or older and have a motor vehicle license approved by the Host (special conditions apply). -	No vehicles to be parked inside the garage (except for 4WD vehicle provided). We were a group of four singles, and this property was perfect for our needs. Everything is to a very high standard, and it is equipped comprehensively so that our stay was blissfully relaxing. Outstanding. Amazing in every way! This home is fantastic. So many listed amenities,... you will be delighted at the extra touch the owners provide. Don’t miss this opportunity to treat yourself to a wonderful experience. This is a welcoming recently renovated immaculate home with wonderful amenities. Close to town, lovely views, walk to beach, chef's kitchen, cmfortable bedrooms, fun spa and outside space. A perfect home for our Christmas vacation. Fabulous home! Very comfortable with lots of luxury. Exceeded expectations. Beautiful home, immaculately kept. Hosts went above and beyond with personal and thoughtful touches - homemade cookies and lovely treats. Would definitely recommend. Lovely Guest & family, communication was excellent. All our house rules were followed and our home left in very tidy condition. Would welcome the Guest back anytime and highly recommend her to other Hosts. Beautiful property that exceeded our expectation. Beautiful property that exceeded our expectation. Even though weather was bad the house allowed plenty of indoor entertainment. Media room, spa and outdoor bar well used.